Reedy’s Rigz makes top-rated fishing gear and equipment for the whole family. Our highly popular fishing rigs such as the Reedy’s Ultra Rigz are used by professional fishermen as well as by hobbyists, with little or no knowledge of fishing. Our Reedy’s Ultra Rigz is already a best-selling product in tackle shops across Australia. We have had many fishing enthusiasts – experienced pros and newbies – approach us and tell us how it has improved their game and helped them catch the biggest fish. Reedy’s Ultra Rigz comes with much improved hooks: moderately heavy circle hooks and Dominator hooks that are capable of catching much bigger fish. What makes these new hooks so effective is that they offer all the advantages of a circle or octopus design, but with a straight shank. They give you an almost perfect catch rate of 100%. We work hard to improve our products day and night and based on the feedback received from our customers we have re-launched the Reedy’s Ultra Rigz with better and more effective Circle Hooks and Dominator Hooks, and a better terminal tackle. Circle hooks are fish-friendly hooks that are perfect for catching large fresh water or salt water game fish such as the Australian Snapper to Reef Fish. These hooks come with a unique circular design which kills the guy hooking fish at the same time as the bait is swallowed. So when you pull on the line, the hook slides forward till it reaches into the mouth of the fish. It then lodges securely into the side of the fish’s mouth. Normally, circular hooks are used for saltwater fishing, but these days they are used in freshwater fishing as well. Reedy’s Circle Hooks are among the best you can buy in the marketplace. They have a highly efficient design and do exactly what is advertised – they help you catch bigger and feistier Snapper fish. Reedy’s Dominator Hooks are considered ideal for a variety of fish species such as the Marlin, Largemouth Bass, Gummy Shark, Perch and Snapper. Dominator Hooks are in many ways similar to Mosquito Hooks – they are designed for live baiting only. These are small-sized hooks that work well with small, fragile baits such as minnows or leeches. Reedy’s Dominator Hooks are the best in the business. They are as good as they get. 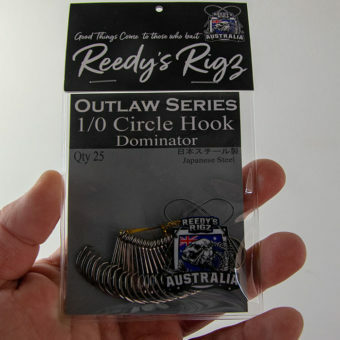 You can buy them with the Reedy’s Ultra Rigs at a nearby tackle shop, no matter where you’re in Australia. Reedy’s Ultra Rigz feature a much improved terminal tackle based on simple but effective swivel and hook system. The fishing swivel consists of a roller or ball bearing. This is different from a barrel swivel system used by flasher rigs. The new swivel system utilizes ball bearings rather than barrels to prevent the line from twisting. This is a more efficient way to do this. 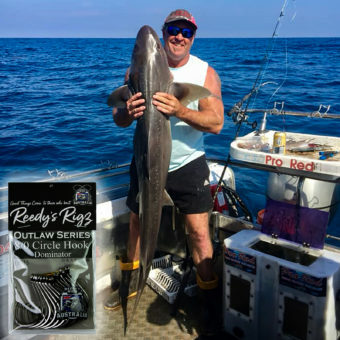 Reedy’s Rigz is one of the most trusted fishing brands in Australia. If you have bought any of our fishing rigs and other fishing equipment before, you already know how good they are. If you haven’t, then just ask about our products in any tackle shop in your neighborhood. You may want to subscribe to our YouTube channel here.